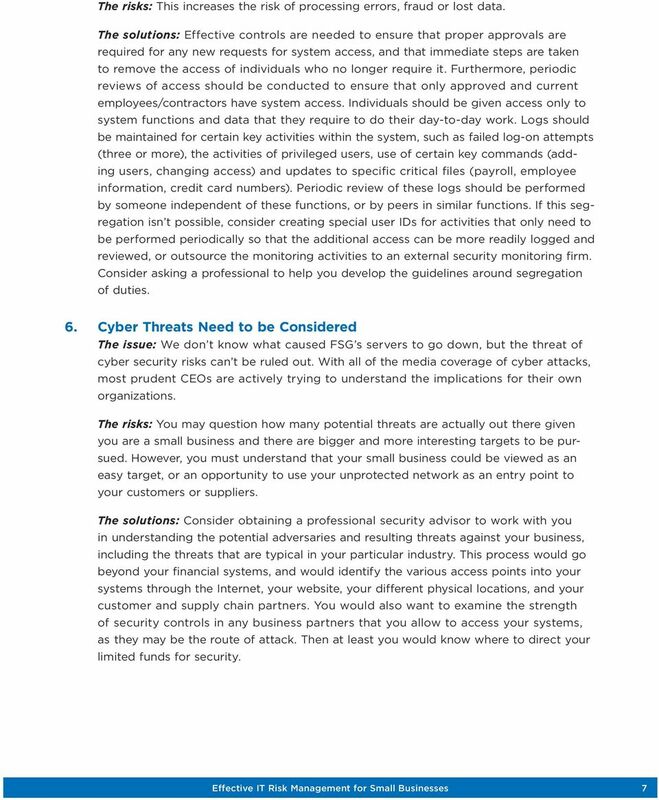 Download "Effective IT Risk Management for Small Businesses"
2 2 Effective IT Risk Management for Small Businesses of taking a vacation in the Caribbean with his wife. As Gabriel was contemplating his company s success, an urgent call came from his operations manager, Carlos Santos, who wanted to meet with him immediately. As Carlos explained the emergency, Gabriel s optimism began to evaporate. The company s main servers had crashed early that morning. The servers that supported all operations including manufacturing, purchasing, finance and customer service had all failed. Even was unavailable. Carlos and his team had been trying all day to fix the problems. Gabriel asked Carlos about his plan to recover the systems. Surely the data had been backed up and could be loaded onto new servers, and the company would be back in business within hours. 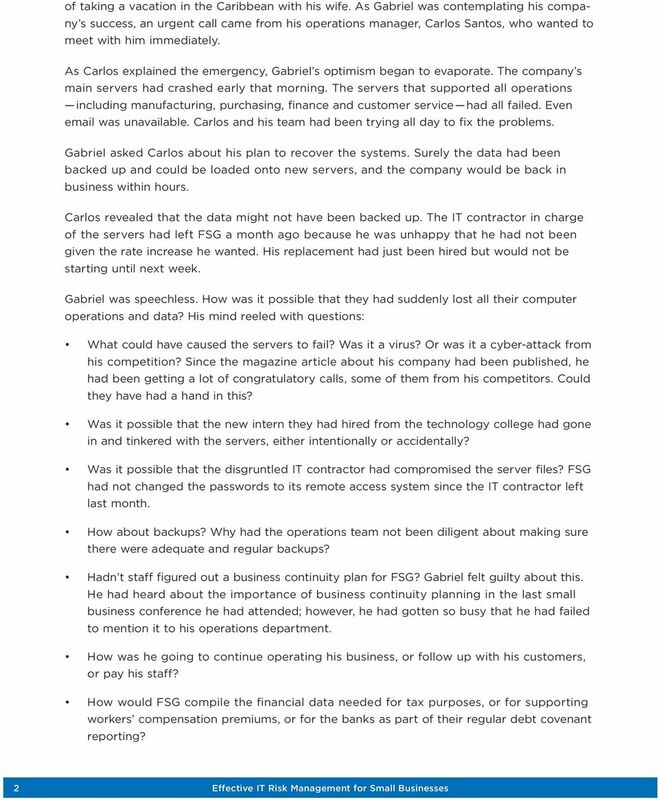 Carlos revealed that the data might not have been backed up. The IT contractor in charge of the servers had left FSG a month ago because he was unhappy that he had not been given the rate increase he wanted. His replacement had just been hired but would not be starting until next week. Gabriel was speechless. How was it possible that they had suddenly lost all their computer operations and data? His mind reeled with questions: What could have caused the servers to fail? Was it a virus? Or was it a cyber-attack from his competition? Since the magazine article about his company had been published, he had been getting a lot of congratulatory calls, some of them from his competitors. Could they have had a hand in this? Was it possible that the new intern they had hired from the technology college had gone in and tinkered with the servers, either intentionally or accidentally? Was it possible that the disgruntled IT contractor had compromised the server files? FSG had not changed the passwords to its remote access system since the IT contractor left last month. How about backups? 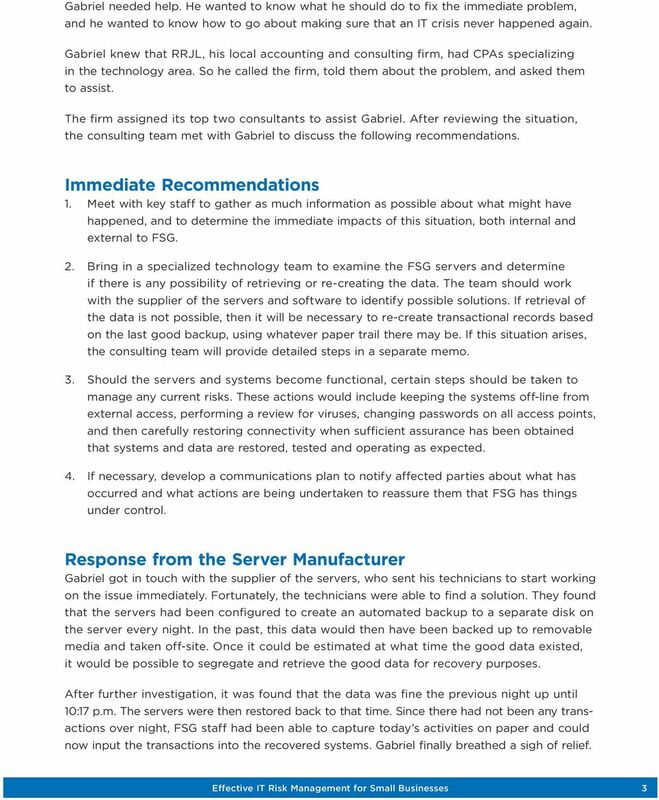 Why had the operations team not been diligent about making sure there were adequate and regular backups? Hadn t staff figured out a business continuity plan for FSG? Gabriel felt guilty about this. 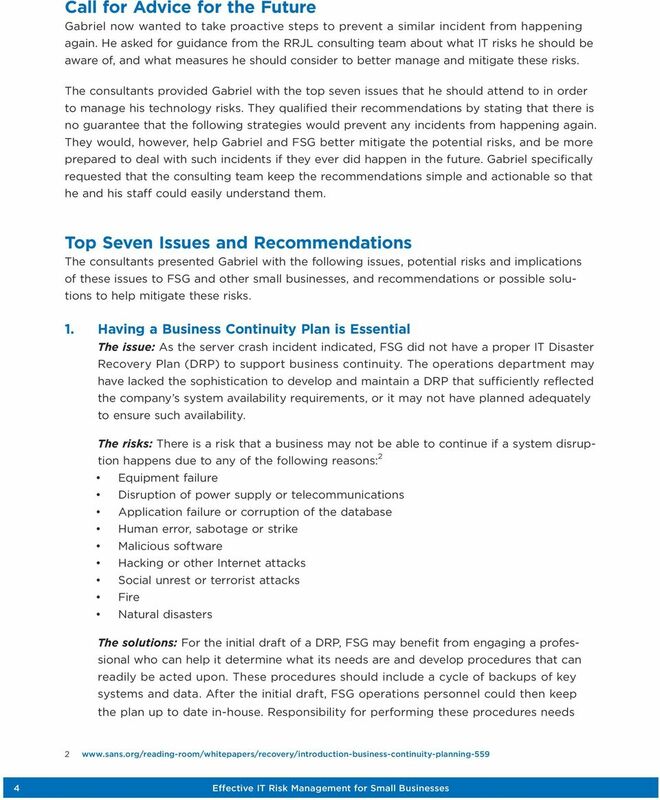 He had heard about the importance of business continuity planning in the last small business conference he had attended; however, he had gotten so busy that he had failed to mention it to his operations department. How was he going to continue operating his business, or follow up with his customers, or pay his staff? How would FSG compile the financial data needed for tax purposes, or for supporting workers compensation premiums, or for the banks as part of their regular debt covenant reporting? 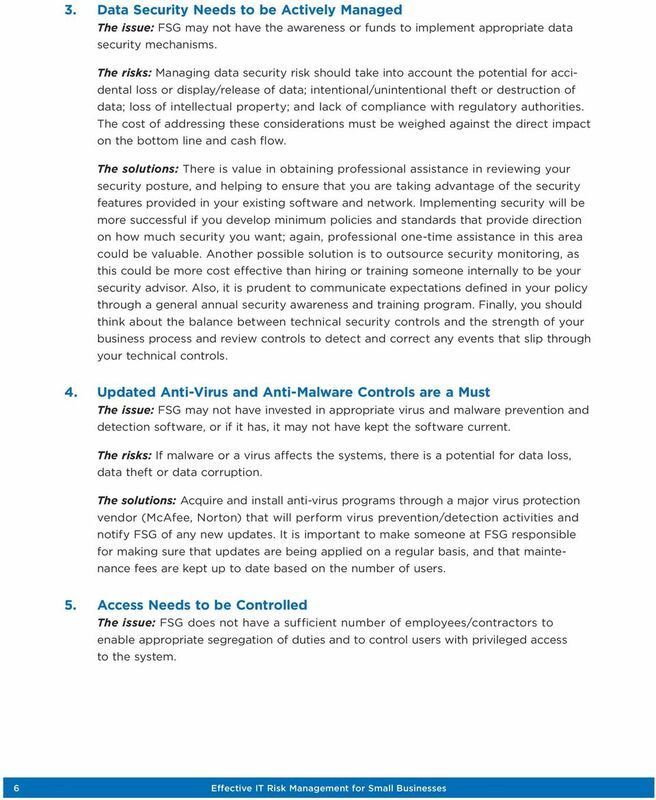 6 6 Effective IT Risk Management for Small Businesses 3. Data Security Needs to be Actively Managed The issue: FSG may not have the awareness or funds to implement appropriate data security mechanisms. The risks: Managing data security risk should take into account the potential for accidental loss or display/release of data; intentional/unintentional theft or destruction of data; loss of intellectual property; and lack of compliance with regulatory authorities. The cost of addressing these considerations must be weighed against the direct impact on the bottom line and cash flow. The solutions: There is value in obtaining professional assistance in reviewing your security posture, and helping to ensure that you are taking advantage of the security features provided in your existing software and network. Implementing security will be more successful if you develop minimum policies and standards that provide direction on how much security you want; again, professional one-time assistance in this area could be valuable. Another possible solution is to outsource security monitoring, as this could be more cost effective than hiring or training someone internally to be your security advisor. Also, it is prudent to communicate expectations defined in your policy through a general annual security awareness and training program. Finally, you should think about the balance between technical security controls and the strength of your business process and review controls to detect and correct any events that slip through your technical controls. 4. Updated Anti-Virus and Anti-Malware Controls are a Must The issue: FSG may not have invested in appropriate virus and malware prevention and detection software, or if it has, it may not have kept the software current. The risks: If malware or a virus affects the systems, there is a potential for data loss, data theft or data corruption. The solutions: Acquire and install anti-virus programs through a major virus protection vendor (McAfee, Norton) that will perform virus prevention/detection activities and notify FSG of any new updates. It is important to make someone at FSG responsible for making sure that updates are being applied on a regular basis, and that maintenance fees are kept up to date based on the number of users. 5. Access Needs to be Controlled The issue: FSG does not have a sufficient number of employees/contractors to enable appropriate segregation of duties and to control users with privileged access to the system. 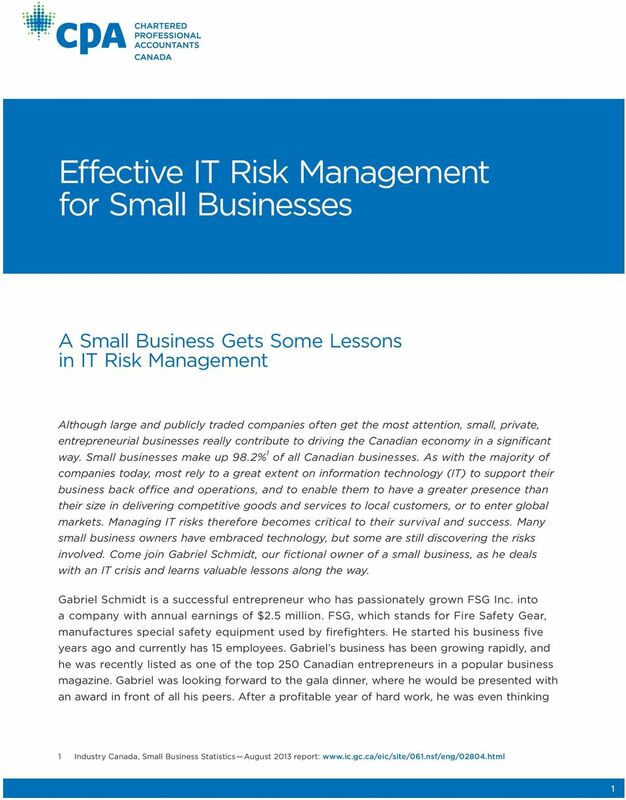 8 8 Effective IT Risk Management for Small Businesses 7. IT Risk Mitigation Strategy Should be Deliberate The issue: Many smaller businesses believe they are successful because they are smaller, more nimble, and not impeded by time-consuming bureaucracy and formal policies. Owners of these companies believe they can effectively manage and stay on top of all activities through their own involvement and the business savvy that led to the success they currently enjoy. The risks: The risk that comes with an informal approach to IT risk mitigation is that the owner cannot do it all. 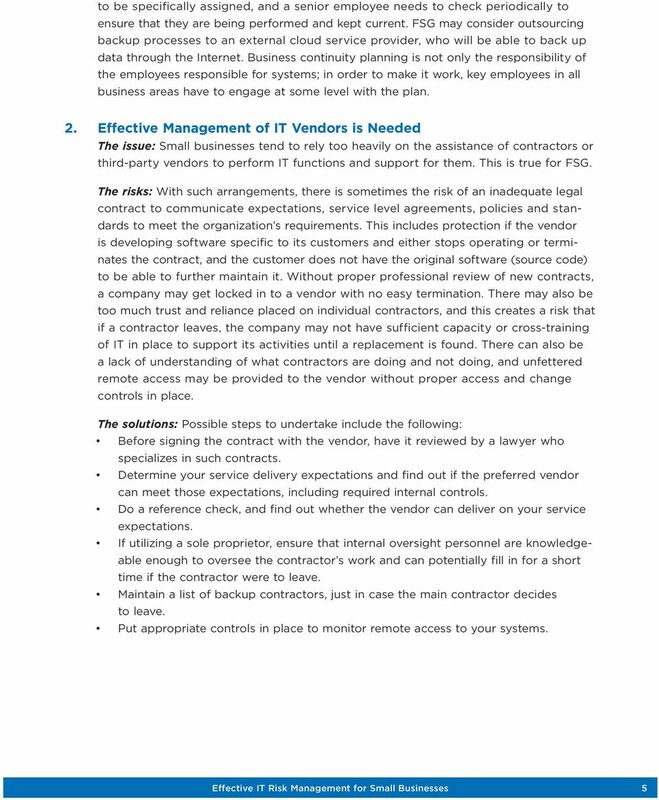 Staff may not be aware of the risks, and without a formal plan to develop mitigating controls and keep staff informed about them, the company is at risk of lost data, unavailability of systems, errors in processing transactions, and susceptibility to attack from either internal or external parties. 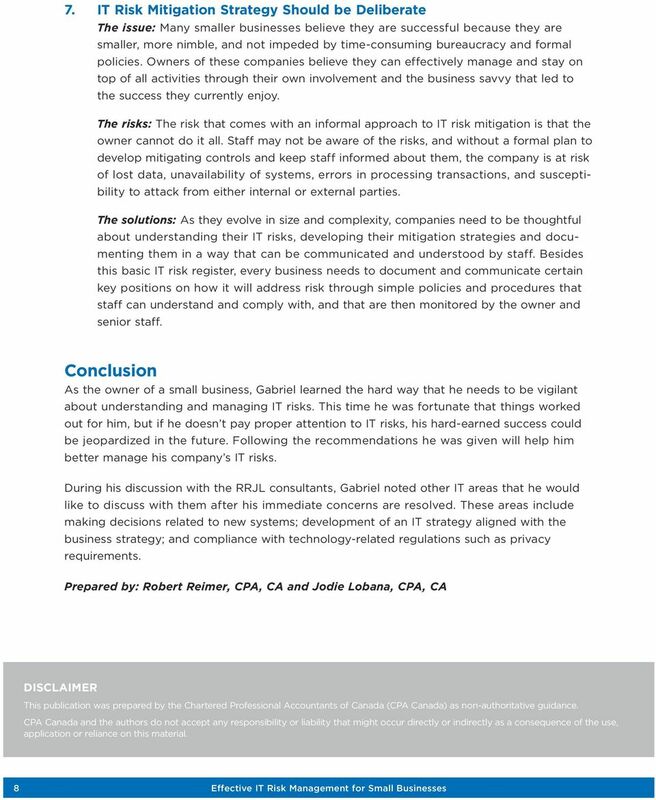 The solutions: As they evolve in size and complexity, companies need to be thoughtful about understanding their IT risks, developing their mitigation strategies and documenting them in a way that can be communicated and understood by staff. Besides this basic IT risk register, every business needs to document and communicate certain key positions on how it will address risk through simple policies and procedures that staff can understand and comply with, and that are then monitored by the owner and senior staff. Conclusion As the owner of a small business, Gabriel learned the hard way that he needs to be vigilant about understanding and managing IT risks. This time he was fortunate that things worked out for him, but if he doesn t pay proper attention to IT risks, his hard-earned success could be jeopardized in the future. Following the recommendations he was given will help him better manage his company s IT risks. During his discussion with the RRJL consultants, Gabriel noted other IT areas that he would like to discuss with them after his immediate concerns are resolved. These areas include making decisions related to new systems; development of an IT strategy aligned with the business strategy; and compliance with technology-related regulations such as privacy requirements. Prepared by: Robert Reimer, CPA, CA and Jodie Lobana, CPA, CA DISCLAIMER This publication was prepared by the Chartered Professional Accountants of Canada (CPA Canada) as non-authoritative guidance. CPA Canada and the authors do not accept any responsibility or liability that might occur directly or indirectly as a consequence of the use, application or reliance on this material. SURVEY REPORT: cyber security Cybersecurity Report on Small Business: Study Shows Gap between Needs and Actions Confidence in a connected world. Executive summary An online survey revealed that while U.S.
About Us. Records Managements. Digitalization & Blackbox Backup Solution. Corporate Membership & Representative Engagements.